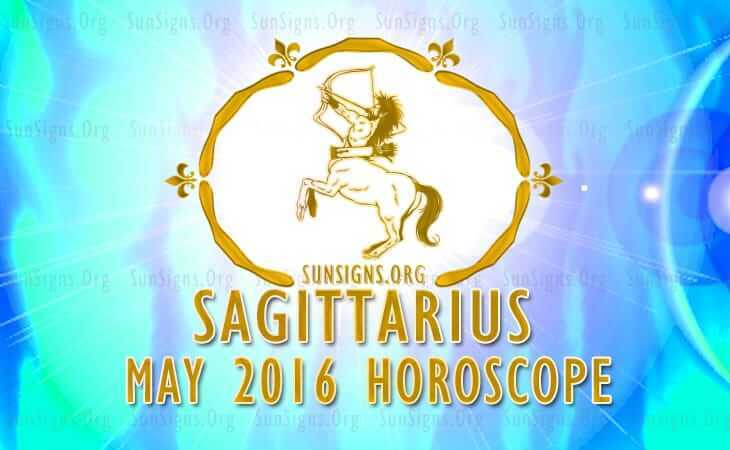 Sagittarius May 2016 Horoscope predicts career and personal ambitions will be important this month. Jupiter too is advancing forward in your natal chart. Domestic issues and emotional aspect of life will be in the back seat. You will be more interested in your outer personality than inner stability. This is a month when Sagittarians will be cautious and flexible. This might not be a good time to be self-confident because of the Mercury retrograde. You might have to depend on collaboration and compromise to succeed in life. In May 2016, spirituality will be of great help when your vitality is down. You will have to face enormous challenges caused by planetary aspects. Relax well this month and save your energy for the future. The May 2016 Sagittarius monthly astrology forecasts that you will get plenty of opportunities to get into new jobs. Enough scrutiny should be done before getting into a new business. There may also be short term turbulence in your career. Financial situation is worrisome for the Archers in May 2016, but earnings are sufficient. You have to work harder till the 21st after which making money will become easier. You should stick to your fiscal strategies and targets as your decisions with respect to wealth matters will be correct. The Sagittarius forecasts for May 2016 suggest that love is powerful after the 21st and you will have the benefit of having a good guide on these matters. This month is highly rewarding for love and social life. You will make friends with influential people. Romantic opportunities for the Sagittarian are to be found everywhere. You will find love at your work place, in social parties, in health and leisure clubs or overseas. Relations with spouse will improve. This is a good month to plan for a pregnancy. Over-emphasis on religion and spirituality may be a hindrance to love. During the end of the month, the family environment gets vitiated due to the eclipse and there may be conflict with your spouse and with other family members. Sagittarius, your health will be fragile after the 21st May. You have to work smartly to save your vitality and relax sufficiently. You can enhance your health by indulging in some creative pastime. To conclude, the Sagittarius predictions for May 2016 suggest that you take life easy and improve your lifestyle if you do not wish to become a victim of stress and tension.